What’s in the Sound Transit 3 package and how much will it cost? This November residents of King, Pierce, and Snohomish counties will vote on the next iteration of expansion of Sound Transit services, known as Sound Transit 3 (ST3). 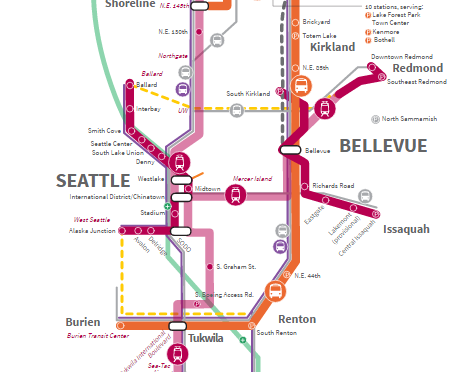 The package includes more than 60 miles of new light rail lines across Seattle, Tacoma, Everett, and the Eastside. As well as Eastside bus rapid transit service, expansion of Sounder commuter rail, and the addition of parking capacity at various transit stations. Needless to say, ST3 is big. Passage of the ballot measure will mean our region will make an approximate $54 billion investment in transit expansion and will see big new transit projects come on line every few years between now and 2041. The Greenwood Community CouncilWe wants to help Greenwood residents make an informed voting decision on ST3. In our September general meeting we’ll delve into the details of the proposed projects in the plan, the project timelines, and the funding structure and projected costs to Puget Sound residents. Please join us at 7:00 p.m. on Tuesday, September 20, at the Greenwood Library, 8016 Greenwood Ave N, Seattle, WA 98103. How will ST3 affect NW Seattle? hOur company provides a wide variety of non prescription products. Take a look at our health portal in case you want to feel better with a help of generic supplements. Our company offers a wide variety of supplements. Visit our health contributing portal in case you want to look healthier. Our company provides a wide variety of non prescription products. Take a look at our health website in case you want to look healthier with a help generic supplements. Our company provides a wide variety of non prescription drugs. Visit our health website in case you want to strengthen your health with a help of health products. Our company offers a wide variety of non prescription products. Visit our health portal in case you want to to improve your health with a help of generic supplements. Our company offers a wide variety of non prescription products. Take a look at our health contributing site in case you want to look better. Our company provides a wide variety of non prescription drugs. Look at our health website in case you want to strengthen your health with a help generic supplements. Our company provides herbal weight loss products. Take a look at our health contributing website in case you want to improve your health. Our company offers herb-based supplements. Take a look at our health contributing site in case you want to look better. Our company offers a wide variety of non prescription drugs. Take a look at our health site in case you want to to improve your health with a help general health products. Our company provides a wide variety of non prescription drugs. Look at our health portal in case you want to to improve your health with a help of health products.